Waterproof materials are protected fromUV rays and sunlight and have a longer life. Indeed, the deterioration of waterproofing membranes is mainly due to heat and UV rays. They damage synthetic elastomers or the oil in elastomer bitumen which become fragile. 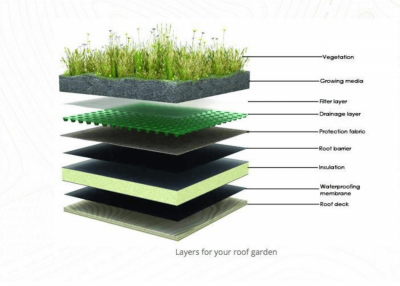 The plant substrate block the UV rays which are responsible for 5% of the aging of waterproofing roof. It is therefore a protection against badweather. These effects combined prolong the life expectancy of the waterproof membrane by 30 to 50 years. The building and their occupants are protected against thermal shocks (cold rain on a hot roof, alternation between day/night or sun/clouds) reducing mechanic constraints which cause cracks. Thanks to thermal inertia,green roofs have a temperature variation of up to 40%, permitting significant reductions in energy costs.Roof membrane exposed to the sun can reach a temperature of 65°C,whereas the same membrane covered with plants stays at a temperature of15 to 20°C. The roof temperature impacts on the building&apos;s indoor temperature, and therefore on the need for air-conditioning. A plant-covered roof with a substrate of lightearth also reduces heat loss in winter. Plants and substrates are some of the best acoustic insulation, as they absorb sound waves, hence reducing ambient sound levels. A 12cm thick substrate reduces sound by up to 40dB - another worthy advantage for areas where planes fly over at a low-altitude. Carefully designed living roofs improve the aesthetic value of cities, and particularly industrial cities. They also add value to habitations which are integrated in the environment. If they are designed with this in mind, they can also contribute to the ecological network ( biological corridors, buffer zones, biological connection zones, substitutional habitats, ecological fords, etc). The positive impact on health does not seem to have been (yet) scientifically measured , but certain indices indicate that it is indisputable. Additional vegetation on roofs produces additional oxygen for cities. The plants and substrates fix and filter many atmospheric pollutants, such as sulphur dioxide and nitrogen oxide; micro, and perhaps even nano particles. Plants, in particular due to dew, retain dust and allergic pollen,and reduce the quantity of particles suspended in the air. An example of this effect is the use by different scientific programmes of moss to analyse the cartography of air pollution, given their capacity to capture and fix even heavy metals . Living or green roofs make a built-up environment more "calm", less stressful. Inhabitants and users rediscover a harmony between urban life and a natural environment. With regard to financial aspects, the CSTB (Centre scientifique et technique du bâtiment), has estimated the following average cost: a garden terrace on the surfacearea, the slope, the selected plants,and eventual necessary reinforcement of the structure, an additional cost of the waterproofness makes this solution less expensive than a tiled or slate roof. It is difficult to evaluate in financial terms the environmental advantages for man, as well as certain additional positive effects: for health, reduction in energy use, increase in life expectancy of the structure etc. The substrate and plants provide additional isolation (mainly againstheat). Temperatures under the roofs fluctuate moderately, reducing heating and cooling (air-conditioning in summer) costs for living or circulation. Living roofs also reduce certain individual and shared costs: health,water resource management, cleaning for which the dust, due to the quantity and relative toxicity, begins to create problems for elimination and storage. Maintenance and repair costs due to flooding, pollution created by sudden rising waters caused by saturated ground, malfunction in grainwater networks, water-treatmentplants, etc. are reduced when plant life is increased on saturated surfaces. A rooftop garden also provides anadditional living space for occupants,adding value to property for rent orsale in an urban environment. A livingrooftop terrace also adds prestige to anoffice building for the companies whohave access. Such a living outside social and environmental engagement.